In Behave, Robert Sapolsky offers an inspired synthesis of how biology shapes human behavior—both the good and the bad. The re-emergence of Neo-Nazi ideology; crowd-funded humanitarian aid; mass shootings with no apparent motive; rescue missions for domestic animals on hurricane-ravaged islands. These stories give us insight into the spectrum of human interactions. But how can the human brain author such a wide swath of behavior? How can the same structure that gave us rhythm and blues also bring us waterboarding? And how can the single brain of one individual both “love thy neighbor” and “hate thy enemy” so vigorously? 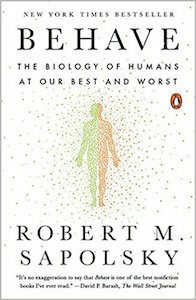 In biologist Robert Sapolsky’s newest book, Behave, we approach some answers to these thorny questions. Deftly synthesizing research from neurobiology, social psychology, cognitive science, and sociology, Sapolsky provides a comprehensive look at why we behave the way we do, making connections between our individual behavioral tendencies and our larger societal problems. A monumental tour of human behavior, this 800-page book outlines the forces that shape our best and worst selves. Much of Behave looks at how biology and psychology govern human action within different time frames: seconds before an action (neuroanatomy and endocrinology), seconds to minutes before an action (subliminal and unconscious cueing), and days or months before an action (memory and neuronal plasticity). This organizing theme runs throughout the book and is used to explain everything from power dynamics to social inequality to racism. It is also true that these mental responses can be tuned by cues in our environment, which happens largely unconsciously. How we perceive a stranger is profoundly influenced by the manner in which we are raised, the people we are exposed to, and the things we are taught. For example, Sapolsky cites a study in which white participants were more accepting of social inequalities after being primed with the idea that race is essential and fixed, and less accepting when primed with the notion that race is a social construct with no genetic basis. Sapolsky brilliantly weaves together research like this to explain many types of human behavior. In writing about the science of xenophobia (“us versus them”), and about the forces that create and maintain power dynamics, for example, he explains how our quest to protect members of our in-group can conflict with modern cultural values around equality, creating the current tensions around discrimination, segregation, and racial profiling. This paradigm manifests across the world and especially in the political realm, where a politicians’ success is often dictated by the ability to prime a group of supporters to the similarities between him and them, rather than their differences (especially when the differences between a candidate and his base are objectively vast on a measure like income). Having tackled why human beings choose to place some people in the “us” camp and others with the “thems,” Sapolsky then illustrates how our tendency to notice differences manifests in social hierarchies that can appear incorrigible. He starts with studies performed in species closely related to humans—baboons, monkeys, and chimpanzees. For one, many species don’t think about “pecking order” in a binary sense (you’re below me or above me), but in a more graded sense—for example, baboons interact differently with the guy one step above them in rank than the one five steps below. Findings like these help us understand the particular importance of our social connections and why we value our social status so much. But Sapolsky is less interested in explaining why humans are aware of social status than in demonstrating the nefarious ways that we are manipulated into maintaining our status. For example, we tend to support some social hierarchies and rebel against others, in part due to the neurobiology of disgust, which is ruled by our sense of smell and a brain area called the insular cortex. Things that disgust us tend to invoke fear, and make us inclined to reach out for our loved ones, property, and way of life, and to hold on to them tightly, even violently. In fact, based on several studies, Sapolsky shows that feelings of disgust are related to more conservative values, so that you can “stick subjects in a room with a smelly garbage can, and they become more socially conservative.” The book is full of several similarly pithy scientific findings and their relevance to our social lives. Spelled out this way, these findings don’t seem to bode well for humans. We have evolved to support our immediate social groups, a tendency that can be easily manipulated into discriminatory behavior, especially at younger ages. The good news, according to Sapolsky, is that there are always individuals who resist the temptation to discriminate and won’t conform to harmful acts based on othering or hierarchy. Sapolsky’s attempt at intervention-advice doesn’t always succeed, which could leave the reader discouraged about the fate of human beings. The fact that there are so many “ghosts in the machine,” working in so many nefarious ways, is disquieting. And this is true even if that nefariousness can be positively hijacked, to unleash the best of our angels. Yet Sapolsky provides some hope about how to steer ourselves toward better behavior. If we accept that there will always be sides, it’s a non-trivial to-do list item to always be on the side of angels. Distrust essentialism. Keep in mind that what seems like rationality is often just rationalization, playing catch-up with subterranean forces that we never suspect. Focus on the larger, shared goals. Practice perspective taking. Individuate, individuate, individuate. Recall the historical lessons of how often the truly malignant Thems keep themselves hidden and make third parties the fall guy. Importantly, Sapolsky makes these points without the classical hubris of a know-it-all neurobiologist talking down to social scientists, which makes his arguments digestible to non-scientists. At the same time, his book alerts basic scientists that their often mechanistic take on behavior can miss some things—namely, an appropriate understanding of how context shapes the biology of good and bad. As a basic scientist who studies biological evolution, I found Sapolsky’s approach convincing, and gravitated to his intrepid story of human behavior. And, as an African American who has engineered much of his social life around avoiding racism (personal and institutional)—the way I live, my politics, the manner in which I communicate, how and where I work—I find it somewhat sobering to learn that racist behavior is a manifestation of a cognitive quicksand that the species continues to fall into, the product of very essential, very real, very tractable biology. This doesn’t make racism inevitable, though, and surely doesn’t excuse it. In fact, Sapolsky’s mastery of the topic, and his emphasis on how context frames how and why we “other,” is evidence that humans can understand and change our behavior. We can treat bigotry and its troubling consequences for what they are: not inevitable, but an arbitrary manifestation of some human characteristics that can be tweaked and tuned by culture and understanding. This message is, in the end, the defining one of Behave: Humans are fragile, capable of much on all ends of the moral spectrum. Because we now understand more about ourselves than ever before, we are finally in a position to do more to bring out the best in all of us. Originally published by Greater Good Magazine. This entry was posted in Biology, Evolution, Psychology. Bookmark the permalink.